With this story dealing with time travel, it's pretty safe to assume that the cliffhanger from the previous issue, where Lois and General Lane are shot to death is something that's not going to stick around and while that could be called a cop-out......... it's a time travel story so really, the crazier the situation that I get before the "reset" the better and that's what I'm looking forward to in this issue. How clever is Jurgens going to be to get us back to our status quo at the end of this Booster Shot story? Let's jump into this issue and see how Booster gets time back on track and how our Man of Steel is affected from his jaunt throughout time and space. Let's check it out. Our issue begins with Booster Gold and Superman in dire straits as the House of Zod are about to burn them to death with their heat vision. 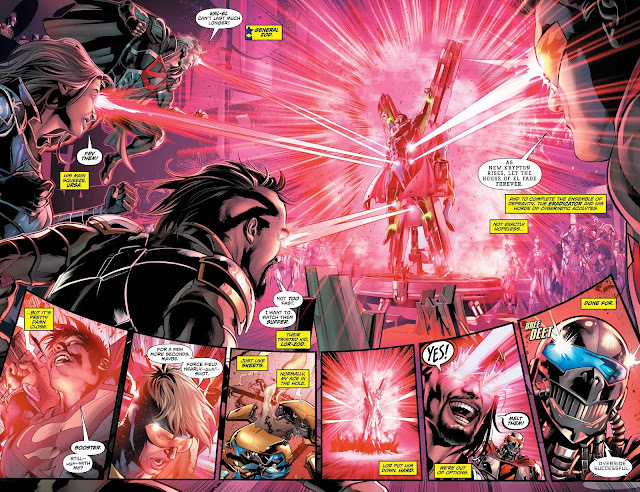 To my surprise, we see that Skeets survived his stomping at the feet of Lor-Zod, but not in the convention sense. It seems that he previously started downloading his programming into one of the Eradicator androids and at the final moments before our two heroes' deaths, the program finally installed and Skeets saves the day by distracting the villains and then freeing our heroes so that they can begin the fight anew. After we see how sick and deranged Lor-Zod is by being willing to let his father die so that he doesn't have to waste the energy to do it later, Superman gets the upper hand on the House of Zod and Booster and him bugger off back to the past so that Superman can make sure that this future never happens. 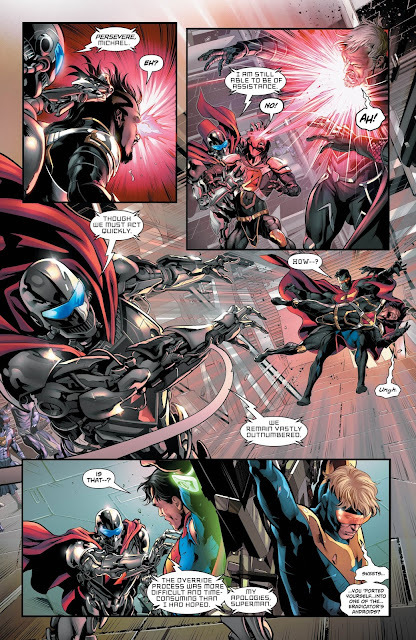 Before they make their way back to the present though, Superman asks Booster to do him a favor and go back to Krypton's destruction so that he can finally have closure about whether or not Mr. Oz is in fact his father and with the Time Sphere making sure that time doesn't fracture again. 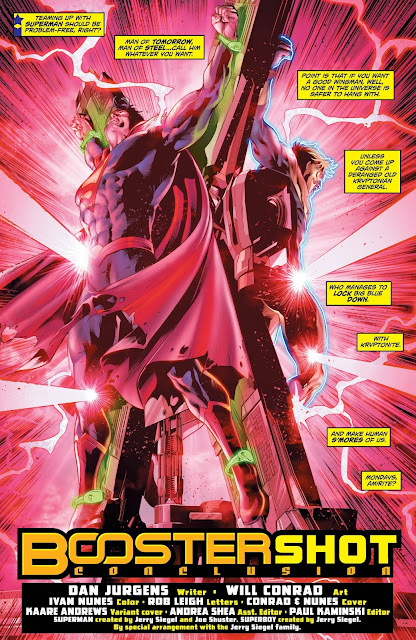 Superman does see that Mr. Oz was indeed telling the truth and with that....... and the terrible sadness that Superman has now that he had to witness his mother and planet's death first hand, the two heroes make their way back to where they belong in the timeline. In the end, Superman goes off to find Lois and Jon, whom Skeets informs are in Logamba, but after Superman leaves, Skeets relays the information to Booster that both Lois and her father were killed a couple of seconds before their arrival. 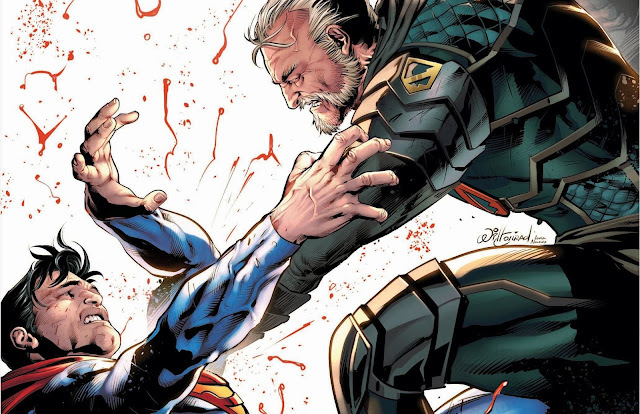 Not about to let Superman face more loss, Booster goes against every rule of time travel by going back a few seconds before and making sure that Lois and Sam Lane make their escape intact. With that, Superman is reunited with his family and Booster goes off to face the consequences of his actions. 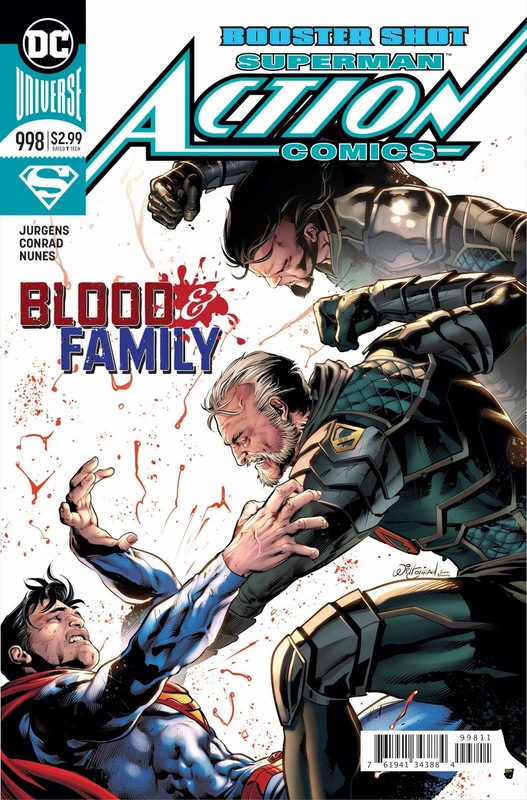 That's it for this issue of Action Comics and even though Superman is still written like a dunderhead for having to have everything that Booster has told him about time reiterated to him here, this issue is really satisfying in its conclusion because it got us back to the story that we all cared about going in and kept the excitement up the whole way through. The art in this issue was excellent and even though the arc had some bumpy roads in the beginning with having to retell Booster Gold's origin, this conclusion more than made up for it because it used the time travel device to its fullest and we got closure to everything that we needed to. Our Booster Shot arc comes to a close with this issue and like the previous one, it's pretty damn satisfying. The art in this issue is amazing and the time travel concept was used perfectly to give us a wrap around that makes everything from this arc come together nicely, while opening doors to future stories.